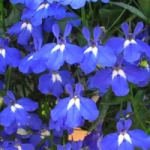 A low growing perennial generally grown as an annual. Grown in full sun to shade, does better in the cooler weather and often goes out of bloom when it gets hot. Look for heat tolerant cultivars. Cut back after first bloom, fertilize and water to maintain flowering in the summer. Is there a mixture I can make up to clear sooty mold from my shrubs? A light mixture of soapy water would work and wont harm your shrubs, a few drops of common dish soap will to every few gallons. The soapy water will also help rid the plant of the aphids which is causing the sooty mold to develop. It may take several applications to completely remove the aphids and clear the sooty mold, be sure to spray the top and bottom surfaces of the leaves. Plant Life Online provides Gardeners a vast searchable index of Landscape Plants, Fruits & Vegetables. Gardening Questions? Ask our Horticulture Experts in the O&A section.